I have spent the last four days in a row sitting on my bum. I don’t usually sit for such long times and normally my back would be in all sorts of trouble with such an unaccustomed biomechanical stress. However, I haven’t had even a niggle of discomfort. I am pretty sure it is because I am doing what love and pursuing the things that matter to me. Sorry – too much psycho -babble? I will give it some context later. The thing that has most floated my boat in the last few days has been Kevin Vowles’ material on ACT and its use in treating chronic pain. The crux of the idea of ACT for pain, is that in pursuing a meaningful life – one that taps into your values and recognises the things that are important to you, pain doesn’t have to play such a big and central role in defining our behaviour. It ties in beautifully with mindfulness approaches. I will write about it in more detail in the coming weeks. For now, I am off to explore Adelaide! 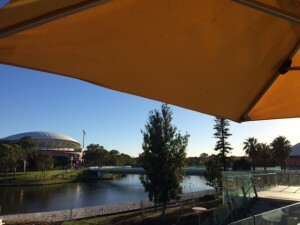 Pain Adelaide – Keep an eye out for it for next year and save the date! A fantastic day. This entry was posted in Uncategorized on March 31, 2015 by beyondmechanicalpain.